And now, back to the business of sewing. A little while ago, my iron was on the outs. This is a common problem that seems to creep up about every two years or so. The hand held irons on the market today are pretty much crap. Seriously, crap. I've been through too many to be in the dark about this and I've been through the gamut of makes and models too. Irons ranging from $10 - $200 and they all give up the ghost at around the two year mark. Its more than inconvenient, its down right ridiculous. But as you know, such is the way of things these days. Everything is made with plastic and only lasts a few years before its time to replace it with more plastic and blah blah blah. Talk about planned obsolescence. So its no surprise that I've been coveting a gravity feed steam iron. When Peter posted about this back in April I was very interested in what his readers had to say. Many were all for him purchasing one for his birthday but then I read a comment from someone else and knew that I was not yet in a situation where this iron would be the right purchase. I live in an apartment and like most apartments, I barely have room for my current set-up, let alone something that I wouldn't really be able to take down and move and the whole she bang. So the gravity feed iron will remain on my list of sewing desires for now. Instead I decided to give a vintage iron a try. When I was younger, I remembered going on a trip with a friend of my mom's to a cabin in Colorado. Whilst at the cabin, of all things, I found a vintage Black and Decker iron (I think it was a Black and Decker, but I could be wrong) that was simply amazing. The thing still worked like a champ and the steam that it produced was nothing less than miraculous. It was like no other iron I had ever used or have ever used since. So remembering that, I decided to take my search to ebay. I found a refurbished old General Electric iron, from a reputable seller who stated that it was in working order, so I ordered it up. The day it arrived, I put the thing to the test. The iron worked. More than that, it produces effortless steam and its something that you can always rely on having if you've got the button up for the steam and the iron is in the down position. I find this absolutely, without a doubt, amazing, because with irons that I've purchased in the past, I don't always get steam, even if I push those stupid "burst of steam" buttons and even if the iron is in the down position. 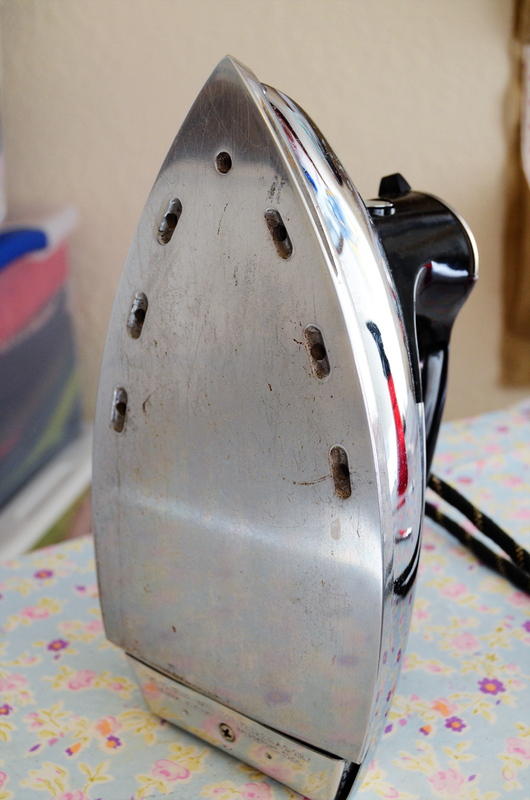 If the iron is heating up as it does often (you know, when the light is on) the steam is off (with the newer irons). Additionally, I've been having problems with my more modern iron not producing steam because its been plugged in for too long - like long after the "auto-off" has shut it down and then you have to shake the iron to get the "auto-off" to turn off and turn the iron back on - AAARRRRGGGHHH! You might have guessed that my vintage GE doesn't have an auto-off. This is AWESOME! Now, of course, you have to be careful and not leave it plugged in, but at least you don't have it shutting off every 8 minutes. What else can I say about this iron? It has a full metal base with, what I'm pretty sure is a bake-lite handle. The cord is wrapped in fabric - the old school way. I really don't have any idea as to how old it is. I was looking on Etsy at similar irons and several of the ads said that it dates back to the 40s, but I'm fairly certain its not quite that old. Definitely before the 80s. I daresay, it might even be from the 60s - definitely not sure though. The only thing that I would say is kind of a pain is that the iron gets really really really hot. I've never used an iron that gets this hot. In fact, the "linen" setting is too hot for linen! So I always do a little patch test on a corner of the fabric before I start really pressing or ironing away. And really, having an iron get too hot is better than not hot enough, which has more or less been my experience with modern day irons. You know that plastic, it just can't handle too much heat. This vintage GE is also a good weight. It's got just the right amount of pressure for tailoring, in my opinion. Plus with the steam factor, its a dream, a DREAM to press with. I plan to give you an update on the iron every now and then, just to see how this old tessie holds up. I've been using it for about three weeks now - still running like a champ! What do you think? Do you think she'll hold up or conk out at the two year mark? Do any of you work with a vintage iron? Good luck with your iron! How do you use the tailor board for a serged seam? Hey, my mother had that iron in the 60's, but you know they didn't change models very often back then. I wish I had any of the irons my mother had when I was growing up. You are right, the only downsides are that they get REALLY hot, and you have to remember to turn them off. But, I guess you could mediate that by using a timer. I didn't realize I could get one of these babies on ebay, so I will go looking. My new irons never get hot enough to sufficiently press a thick cotton. I too no longer will buy a new iron. In fact, I usually find the older models at garage/rummage sales and for only a couple of bucks! Love that there is no auto-off feature. Used to drive me up the wall because every time I wanted to use it, it would be off. Plus the older models have extra long cords. Love that too. I have mine plugged into a power strip along with a lamp. I know that the iron is off when the light is off. I'm sure you're going to love your new (old) iron. woooo!!! can't believe i won! thank you, all is going to a good home! i never thought to look for an older iron, but that's a great idea. i have a cordless iron, but recently the water reservoir melted in spots and leaks. i've been using a spray bottle instead but lately have been really missing the steam! I'm glad that you posted this. Because I have the same to be true with my irons. They don't last more than a couple of years. Right now I have one that I've only had for about a year and a half, it is losing it's heat. Plus, it takes forever to heat up and to put out steam. And you are so right about the button for pushing steam out! Those are awful. Thanks for writing this great post! Sometimes, I thought that it was me. That I was not taking good care of my iron. Especially this last one because it's supposed to be a good brand. I loved my vintage black and decker iron. It finally sprung a leak last year and bought a modern b&d but it's not the same. I have dibs on my mil's vintage iron though! I purchased a vintage Sunbeam from Ebay a few weeks ago to get an iron that wouldn't shut off. So far, I LOVE IT! Your "new" iron looks awesome! What a great idea to look for a vintage iron...I *just* replaced a Rowenta that lasted (you guessed it) 2 years. And it was pretty spitty that whole time. I ended up buying the brand "Reliable" hopefully it will live up to it's name. It has great steam, and you can have steam at any temp. Also I can disable the auto off feature. If (when) this one dies I may look into vintage instead! I needed a new iron after my very expensive old one died a horrific death, spraying all sorts of nasty stuff over lovely fabric. I was never terribly happy with it - but I did love the weight, it was HEAVY when most modern irons are too light. So far, I LOVE it. 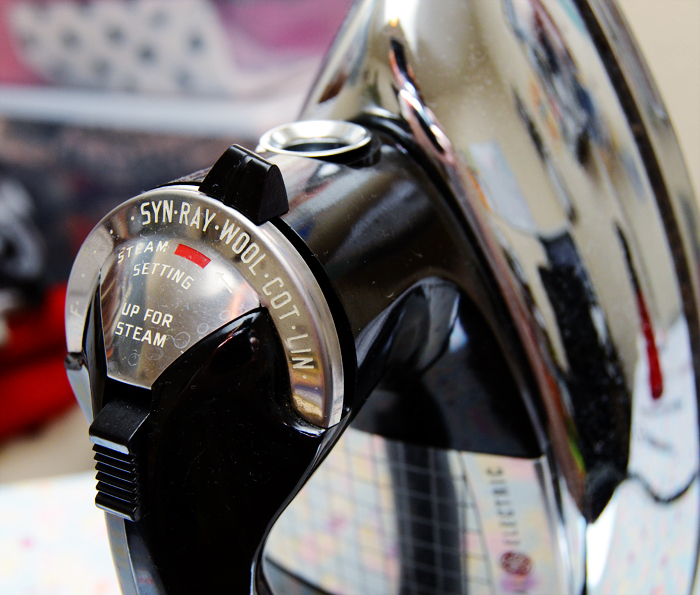 It works just as an iron should work -- essentially how you described yours, and the weight! It's even heavier than my original iron and it's perfect for getting wrinkles out, pressing pleats, etc. If this one dies prematurely - I'll definitely keep an eye out for a vintage one instead! 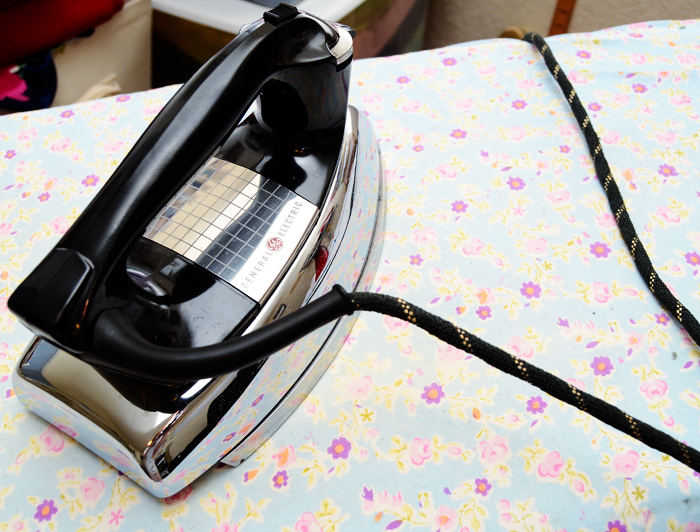 This is the iron I grew up using! I used it for years and never thought about it's greatness. It got a good workout what with the sewing both my mom and I did and all the regular clothes ironing. (We ironed everything in the 1960s when I was a child.) Modern irons are just not the same. I have been thinking about doing the same thing as you. Every time I'm in Goodwill I check out the irons, but I have only found worthless modern ones. I will continue to look. How cool! I have been more and more frustrated with my "modern" iron for all the of the exact same things you described! Maybe I will have to look into getting an old faithful as well :) Any tips for the search??? I grew up with that iron (my mom had it before I was born circa 1982). If she hadn't misplaced it when we moved 16 years ago, I'm sure it would be mine (I feel the loss). Have fun with it! NOTHING steams the way it does. @Maria - I don't know exactly what you are asking, but a tailor board has many uses. If a seam is serged then you would simply press the seam to one side instead of open, however usually you aren't using the tailor board to press serged seams. Its getting the inside of those hard to press areas that it really does its magic. For example in a collar - you can get those collar points nice and pointy and its so much easier to turn the collar when you've pressed the seam allowances open on the inside with a tailor board or point presser. I'll be sure to do a post on the uses of the tailor board. @Becky - Couldn't agree more. The newer irons just don't get hot enough. @Carol Claytor - The auto-off was one of the biggest driving forces into looking at a vintage iron. That thing just drove me crazy! I did find an Oliso iron that had a 30 min auto-off but after reading many of the reviews on amazon I was totally discouraged about getting that iron. Plastic, just like everything else now days. @lisa g - Can't think of a better winner! Yay! The vintage irons are pretty awesome, have to admit. I'm seriously converted and what's more I'm pretty sure this iron is going to last awhile. I'll keep y'all updated. @Cherie - Its definitely not you! I've really tried to keep my irons in good health, but seriously, they are done after two years. They just aren't made to last these days. @LeeAnn - I have gone through several versions of the newer "classic" black and deckers and you couldn't be more right - they just aren't the same. At all. @Linda T - Awesome! Great minds think alike, right? @Kelly - My last iron was a Rowenta too. The steam was the problematic factor for me. I've tried some of the Reliables, but only at sewing conferences. They seemed decent and they did produce a lot of steam. My only worry is their longevity. @Naomi - I've gone through several iterations of the Black and Decker classic. Its definitely the best out there for all the modern irons I've tried and gone through. My problem with the newer model is still the steam - its off as the iron heats up every few minutes. My vintage iron has steam even if its heating up. Its especially spectacular. @VictoriaR - This is so fun to hear! Definitely continue to look for the old irons - they just can't be beat. Especially if they are still in good working condition. I'm very excited to see how long this one lasts. @Sally@the quirky peach - I would say purchase from a reputable seller. This one had been gone over with a fine tooth comb and cost me about $30. There were many on there for cheaper. Doesn't mean that they aren't good, but just be careful. I saw a lot of irons that were meant for "decorative" purposes. As long as it says that it is in good working condition, I think you should be fine. @Tiffany - the steam is amazing. I have steam every single time I want it. Every time. There is nothing like it! @Virgina - Isn't it though? Its awful. If there was an iron on the market today that would last at least 10 years, wasn't made from plastic, had great steam, got really hot and no auto-off I would back it 100000%. But there's nothing like this out there except the vintage irons. Sad. So sad. I have a 1957 General Electric (it came in its original box with the warranty card still inside) non steam iron that I worship. I bought it at a garage sale 11 years ago for $1. Best dollar I ever spent. Like you I go through irons at an incredible pace, sometimes more than one a year. I use this one only with cotton or linen, it would melt anything else, even at lower temps. I live in dread of the day it dies. I use a vintage iron too! I actually originally bought it as a backup iron but now I use it instead of my modern one! It gets hot super fast, it's nice and heavy so it presses things crisply, and I the fact that it doesn't shut off while I'm sewing is very nice. If it ever dies I'm searching the thrift shops for another one! You do have to remember to shut it off afterwards though- I think that's the only negative aspect! I find this fascinating! I also go through irons like crazy - a new one about every two years - but I thought I was unique! I do a lot of ironing, and then throw sewing into the mix and my iron gets used a lot. I've experienced every single thing you described with my irons - not heating up enough, not producing steam. I'm so glad to know I've not been imagining these things! Hubby is checking out Ebay as I write . . . !! I like the vintage iron, solely based on its looks. What is the price range for one of these things? Sigh.. why can't we convince an iron manufacturer to make an iron like that NOW - study, great steam, etc. Surely it could be done within the price range of a Rowenta, nice pricey thing that only lasts a year or two... humph. My non-ironing Dad gave me my late Mom's 25+ year old steam iron, which I have been using for 5 years, and I haven't looked back. The thing is a tank! I like Naomi have a B&D iron that I found in Home Depot for about $20, of all places. I got it about 10 years ago and it's just as you described. No auto-off, great steam, heavy base. I got it when I was going through my heavy quilting phase and I have been happy ever since. I'm looking at a similar iron on ebay for many of the same reasons! They look close to your iron! are older than I am (and I'm 65). They crackle occasionally when they're hot (so I always know when they're on), and they haven't failed me yet. I prefer to spray or dab water onto the thing being pressed, and love not ever getting steam-hole impressions on my work. I too am going crazy with the iron issue. I had a vintage iron which worked good but I didn't like that I couldn't press my light weight knits without burning them. So for mother's day I asked for a iron by Reliable. I had been researching irons for a number of months previous to my purchase. I really like this iron because I get incredible steam at really low settings! I haven't had it long . . . but so far so great! When I first started sewing I had a newer old one of these. It worked wonderfully well until I dropped it one too many times and the plastic cracked off the iron. So don't drop it on hard floors. The only other thing to look out for is if your water has a lot of minerals in it. They can eventually clog up the steam valves but that can be fixed by cleaning the iron every so often. That's a good point to remember, you shouldn't use tap water in an old iron, I remember my mom being very strict about this. You buy distilled water at the supermarket and it has no minerals in it so should keep it clean and steaming without the residue. I was planning to splurge on a super-duper sewing iron, but am totally going to hunt for an old one now...thanks for sharing! Hi Sunni! I loved this post, especially since I had just posted an item on irons this week on my own blog. The new retro model of Black and Decker has some toxic chemical in the wire covering I had read about, which is why I went for a new retro Hamilton Beech model. I do not use water in this machine but a spray bottle and pressing cloth. 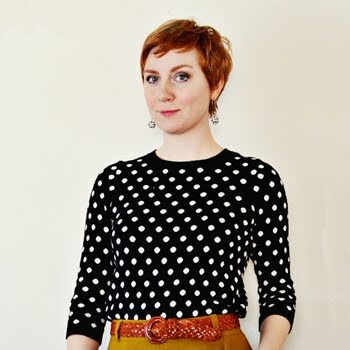 I loved your Craftsy course, and follow your delightful blog. You should definitely get one of those rubber heat protectant mats so you can leave the iron in the down position. Save some stress on your shoulders. And a teflon shoe of course. How cool (!) is that. I never would have thought of it. Brilliant! I've just been thinking about irons! I used to have a great old iron that I picked up for a few dollars at a thrift store. It was reliable, very hot, and had light pink handles and features, but I decided to get rid of it right before we moved across country. Now I have a Rowenta, which is fine. I hate the auto-off, the steam is unreliable, I get calcium deposits, and it leaks water at seemingly random times. It hasn't destroyed any fabric yet, but it seems bound to happen. Maybe it's time to start checking thrift stores again. Oh, Sunni! I just wanted to say thank you for posting this topic about irons! I thought I just had bad luck with irons. My irons were breaking every other year! So, I checked out Ebay and found one that looked similar to yours. 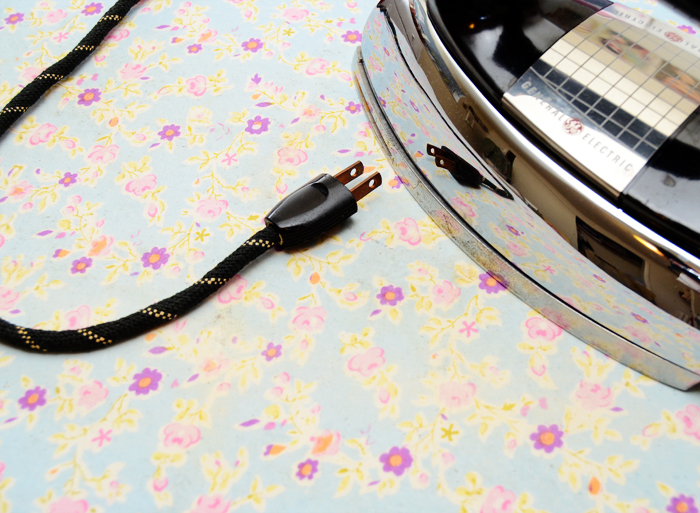 I bought the General Electric iron. Not sure if it was the F50. Anyway, it works great! I love this iron. I didn't buy it for a $1, but it cost the same one as my new one. I'm not going back on this one! It's just so heavy duty. Thank you for this post! I found a vintage iron with a bakelite handle on a Craigslist-like website at my university for only $5! The owner agrees with you in that it runs quite hot. Not sure if there is a working steam function, but I am excited to try it out.